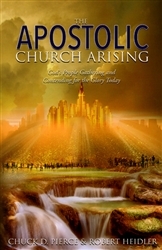 There is an apostolic church arising that will now go beyond any demonstration that has been known in the earth. The Apostolic Church Arising is foundational to understand the Church, the Kingdom, the warfare ahead, and a triumphant people who will enter into God’s promises! From generation to generation and season to season, the Lord rebuilds His Church, so His Kingdom can be better manifested in the earth. Originally, the Early Church moved in a continuous revival that reached the known world in one generation. A key element in their success was the establishment of Apostolic Centers. Today, the Church is meant to continue in this legacy and unlock a kingdom mentality in the earth that will overcome the world. The Apostolic Church Arising traces the history of the original apostolic centers that we read of in the New Testament to the “now” of their multiplication and existence. This will help you better understand the apostolic prototype the Lord created for His Church to overcome the gates of hell. Join the Triumphant Reserve who is embracing the administration of a new apostolic church, filled with power and glory! As you read this book you will sense yourself arising with Kingdom power and authority. Become one of those who demonstrate His glory today!